When President Reagan took office in 1980, he promised to reduce the number of federal agencies and rules. Eight years later, his Presidential Task Force on Regulatory Relief failed to eliminate a single agency or even one of the thousands of federal regulations. Today, President-elect Trump has promised to stop HUD’s Affirmatively Furthering Fair Housing and reduce all regulations by 70%. The good news is, even though the rescission process may be arduous, the change to the new administration will almost immediately blunt some of AFFH’s worst consequences for communities. HUD does not want to risk exposing a confiscatory agenda that does little to help the poor. Before I offer my suggestions for neutralizing HUD’s anti-Constitutional activities, let me explain why this process of reigning in HUD and all federal agencies is imperative, no matter how rigorous it may be. Most people may not realize that the federal agency bureaucracy, not Congress is now the primary lawmaking body in Washington DC. In 2015, while Congress passed 115 laws, over 400 agencies churned out 3378 regulations, all with the full force of a congressional law. Our Founders never intended to create a nation swimming in laws. They knew that more laws encourage citizens to lose their self-reliance and become increasingly dependent on government for fairness, support and decision-making. That is why Congress alone has law-making authority and why the people control Congress. Decades ago, Congress began surrendering their responsibilities to federal agencies so they could manage the details necessary to implement legislative laws. Today, those ‘details’ have enabled federal agencies to dwarf Congress. Unelected bureaucrats flood our nation with 3,000 to 4,000 new laws every year. Federal agencies’ sub rosa regulatory activities and guidance number in the tens of thousands every year. Clyde Wayne Crews, Jr, in a Dec 2015 report for the Competitive Enterprise Institute, explains that sub rosa regulations or ‘guidance documents’ can consist of agreements, bulletins, information sheets, manuals, memorandum, advisory opinions, clarification, etc. Most fall outside of the already weak regulatory review process required for agency rules. The IRS drew from a culture of informal memos and unwritten innuendoes to delay and reject conservative Tea Party applicants for non-profit status. Since there were no traceable rules, the President easily declared there was not even a “smidgeon of corruption,” even in the face of what later proved to be massive rights’ violations. In 1946, Congress passed the Adminstrative Procedures Act to protect consumers by creating a “notice and comment” rulemaking process. The APA gave citizens the opportunity to review proposed rules in the Federal Register and voice their responses before they became law. But, according to Crews, agencies frequently use decrees besides rules to sidestep the APA. Threats are another way agencies force constituents to comply that leave little evidence of the coercion and less recourse for the individual. Operation Choke Point was a Department of Justice initiative that forced banks to withdraw services to politically disfavored businesses including payday loans, pawnshops and gun shops. There was no law, no regulation or even an executive order. It was simply a list of targeted companies provided to banks accompanied by threats of internal reviews for failure to comply with federal guidelines. There is nothing in the Fair Housing Act authorizing HUD to demand that Dubuque IA issue section 8 vouchers to low-income families in Chicago, 180 miles away in another state. Yet, under legal threat for a failure to affirmatively further fair housing, the city buckled to the bureaucrats’ outrageous demands. Federal agencies have become so powerful that they can now use existing Congressional authority to write rules and guidance documents to control virtually all of our society and economy without congress passing another law. During his campaign, Donald Trump talked about “draining the swamp.” Much of the swamp is in the federal agencies. Because federal regulations have the force of law, and legislative protection, any long-term regulatory changes the new President makes will require working with Congress to create legislation. This means developing strategies to avoid a potential Senate filibuster. It also means the administration will need the courts to uphold challenges to new laws, or to invalidate existing rules. 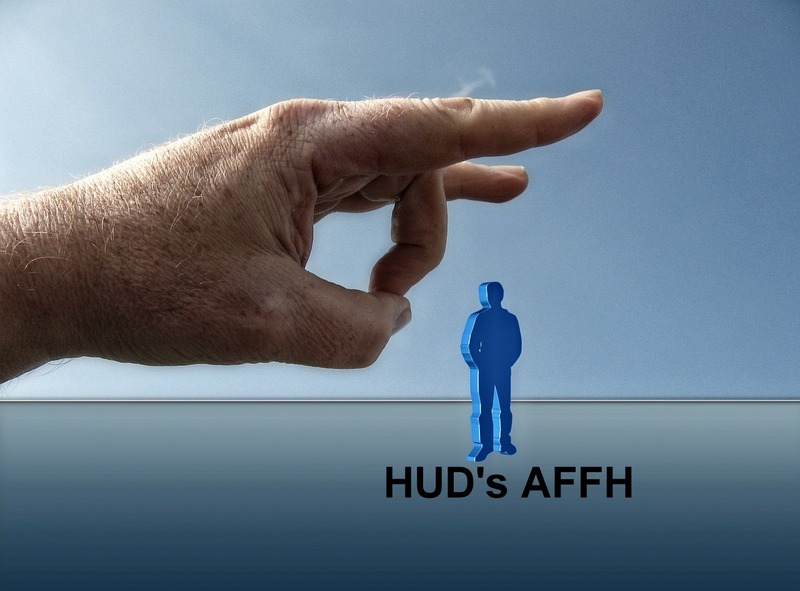 Review the Cost-Benefit Analysis for HUD’s AFFH – Though law requires it, agencies are notorious for ignoring or submitting shoddy cost benefit analyses. Review the actual financial effects of AFFH on communities. If appropriate, bring legal action to halt the program. Form a HUD Action Review Committee. Require HUD departments to submit proposed Compliance Reviews or legal actions against grant recipients to HARC for approval. HARC reports to the HUD Secretary. Encourage whistleblowers to expose dubious sub rosa activities. Begin a process of removing guidance documents, threats and practices that are antagonistic to local rule and property rights. Replace these activities with pro local autonomy practices and policies. Congress can pass new legislation to counter the effects of AFFH. Courts tend to disfavor legislation designed to block existing agency regulations. Therefore, it will be necessary to have strong Constitutional voices on the Supreme Court to uphold the new laws that protect local rule and property rights. Redirect the Justice Department to focus on the primacy of property rights and local rule. DOJ actions should first consider the Constitutional rights of States and of the people above federal agency initiatives. Use the appropriations process to limit regulatory activity. So far, Republicans have found it difficult say ‘no’ to agency appropriations. With a member of their own party in the presidency, this is now a viable solution. Work with Congress to amend the Congressional Review Act. Congress has 60 days of legislative sessions following issue of a rule, in which to issue a joint resolution of disapproval and rescind an agency rule. The CRA generally fails because Congress lacks the votes to override the President’s likely veto. Since the CRA passed in 1994, agencies have issued 84,310 regulatory rules, not counting hundreds of thousands of guidance documents. The CRA process rescinded one. The President can work with Congress to amend the CRA to make it easier to rescind regulations. Amend the Administrative Procedures Act. Change the Act to require Congressional approval for major regulations. Pass legislation requiring Congressional oversight of guidance documents. Agencies issue 20 times as many guidance documents as they do rules, though they can have a powerful and terrifying effect on citizens, businesses and jurisdictions. It is time for Congress to review or limit them. Investigate attempts of agencies to use guidance documents to sidestep the Administrative Procedures Act or any regulatory oversight. There is also much communities can do to protect themselves from HUD’s AFFH while waiting for the administration’s processes. Do not sit on the sidelines. Work with your Congressional representatives to support efforts to reign in federal agencies; and with your State representatives to block HUD’s attempts to manage local authority and regionalize your communities. With a new party in power, expect a reduction in HUD’s aggressive litigation actions. The agency does not want their aggressive tactics, nor their invasive programs, like “income diversity” or “Move to Opportunity,” exposed. Until the administration or Congress rescinds HUD’s AFFH rule, continue to reject HUD grants. Each time your community accepts a HUD grant and the AFFH rule is alive, you are creating a future retroactive liability. Look for alternate ways to fund housing and urban development. Some communities are looking at Foundations and Trust Funds that provide grants to communities. Others are researching donation matching with local corporations to fund projects. Stay involved and informed. We face threats to our communities and property because for decades, we failed to follow legislation and monitor what our politicians were doing. It is a mistake we cannot repeat. Although your comments are primarily focused on HUD, the same (or worse) exists in the EPA, DOE, FEMA, NOAA, etc. Draining this swamp is like draining Louisiana bayous — it’s a daunting task!